Consistent with the mission of the University, the Department of Imaging Sciences at Adventist University of Health Sciences (ADU) provides a Christian educational environment that prepares students to become skilled imaging professionals who possess technical expertise and personal characteristics for successful employment. The program is designed to prepare students to sit for the American Registry for Diagnostic Medical Sonography (ARDMS) examinations. Since the program is accredited by the Commission on Accreditation of Allied Health Education Programs (CAAHEP), 25400 U.S. Highway 19 North, Suite 158, ​Clearwater, FL 33763; (727) 210-2350, graduates will be eligible to sit for the national examinations upon successful completion of the program. Program graduates will be eligible to apply for an examination administered either by the Nuclear Medicine Technology Certification Board (NMTCB) or the American Registry of Radiologic Technology (ARRT), and subsequently may be licensed by various state agencies. The Nuclear Medicine Technology Program is accredited in accordance with the standards as set forth by the Joint Review Committee on Educational Programs in Nuclear Medicine Technology (JRCNMT), 2000 W. Danforth Road, Suite 130, #203, Edmond, Oklahoma 73003; (405) 285-0546; e-mail: mail@jrcnmt.org. 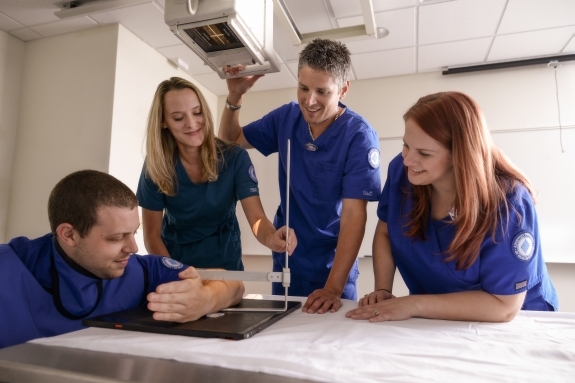 Graduates will be eligible to apply for the National Certification Examination administered by the American Registry of Radiologic Technologists (ARRT), and subsequently may be licensed by various state licensing agencies. The A.S. Radiography Program is accredited by the Joint Review Committee on Education in Radiologic Technology, 20 N. Wacker Drive, Suite 2850, Chicago, IL 60606-3182, (312) 704-5300, fax (312) 704-5304. The program follows the standards for an Accredited Educational Program in Radiography. These standards are available for review at www.jrcert.org. • Nuclear Medicine Technology, B.S.